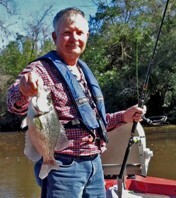 MAY CRAPPIE TOURNY - BJ MARINA - Lake Houston Fishing! B.J.’s Marina, 27907 Calvin Road, Huffman, TX 77336.---Entry fee is $30 per person. for the top three heaviest 7 fish strings and the big fish of the tournament. You can enter at B.J.’s Marina anytime until the start of the tournament. 1. One or more people per boat, $30 per person. 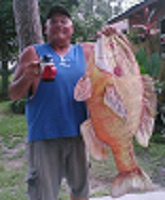 $5 goes in big fish pot, balance pays top three places 50%/30%/20% (Less permit cost). here to commit their entry and pay at weigh in. Looks like it's going to be another wash out. Currently the water is over our bulkheads here in the bayou. Enter at your own rapids, I mean risk. That's alright Randy it separates the men from the boys, You know if it is not ideal a lot of them will not get out. Hell all it takes is one-three fish to win it. We only had two fish per team last time, except me and Greg only had one. Come on guys B J has been buying the permit for the last two months at least show up for him if anything, He is wanting to do it once a month and said he would buy the permit every month so lets show him some support. I would love to be there but I am back working Saturdays. that were out practicing up for the tournament. You scared! Only 3 boats took part in this event which has been rescheduled for the third Saturday, 20th in June. Pay-out ($25.00) was for big fish only to Lamar. Entry fees will be transferred to June 20th Tournament.